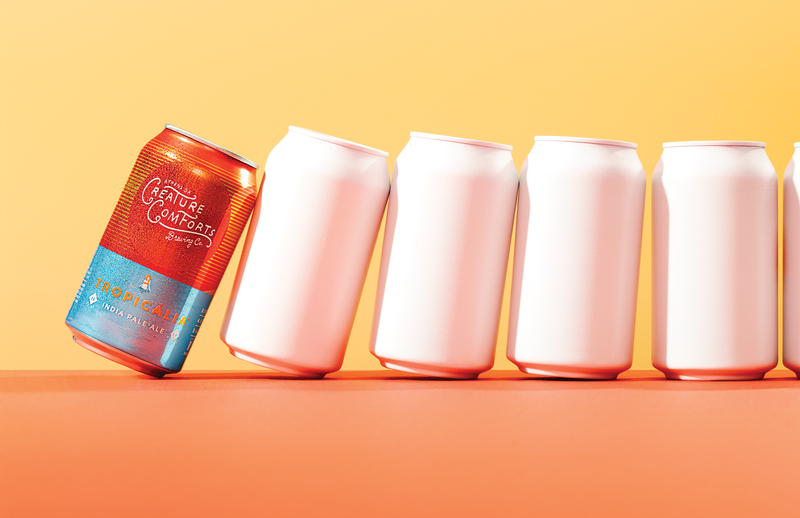 Every 10 days or so, a few cases of Tropicália—a hoppy, citrusy IPA made by Creature Comforts out of Athens—arrive at Ale Yeah, a boutique beer shop in Decatur. From there, it’s moved promptly to the back of the store, out of reach and view of customers. Doesn’t matter, though; by day’s end, it’s sold out, bought by customers who know enough to ask for it. Tropicália is now responsible for 60 percent of Creature Comforts’ business. It has become the brewery’s flagship, even though, like most small brewers, Herron and Beauchamp had never intended to even have a flagship. Today the brewery is producing 300 barrels of Tropicália a week. (A barrel is equivalent to 31 gallons.) Gathering the right ingredients in larger quantities—like the Galaxy hops from Australia that help give Tropicália its distinctive citrusy notes—has been a challenge. As it is, the overwhelming demand for Tropicália ties up fermentation space, preventing the brewery from delivering on its other year-rounders, much less experimenting with new beers. (Creature Comforts’ year-round beers include Bibo Pilsner, Reclaimed Rye, and Athena, a Berliner weisse.) Herron would like to release Reclaimed Rye in cans, for example, but there’s currently no way to make it happen. Instead, he’s stuck in a tricky position: Customers want new releases, but those same customers would complain if it meant less Tropicália. In Avondale Estates, meanwhile, Wild Heaven Craft Beers has experienced a similarly rapid ascent for its popular Emergency Drinking Beer. After the beer hit shelves in its distinctive “caution yellow” cans, it took a mere two months for EDB to become precisely half of Wild Heaven’s overall annual output of 7,000 barrels. The irony is that Wild Heaven earned its reputation by making higher-alcohol, Belgian-inspired ales. EDB is the opposite. But Purdy doesn’t see that as a problem. Not even close. Eventide’s dry, roasty stout is Atla­­nta’s most und­er­rated year-­round dark beer. Rich, flavorful and only 4.8% ABV, it gives Guin­ness a run for its money. Hugely juicy, with sweet citrus and tropical fruit notes exploding from the glass, Scof­­­flaw’s new IPA is already sought­-after. Watch out, Tropicália. Complex, spicy and ultra-quaffable at only 4.2% ABV, this pater­sbier is the per­fect choice for Belgian beer lovers looking for moderation.